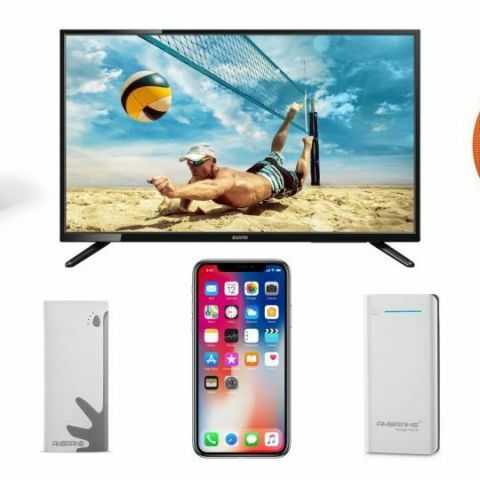 Paytm Mall is offering considerable discounts on various consumer electronics and we have aggregated some of the best deals one can get on the e-commerce platform right now. Paytm Mall is offering discounts and hefty cashbacks on a range of electronic devices like smartphones, powerbanks, speakers and more. We have rounded up the best of the lot here, at one place. The 32-inch Sanyo XT-32S7200F LED TV supports viewing full HD videos and features a 60Hz screen refresh rate. It comes with two 8W speakers and in terms of connectivity sports 2 USB and 2 HDMI ports. You can buy it here. The 20800 Ambrane powerbank features a Li-ion Samsung battery cell and comes with three USB charging ports. The company says that it lasts for about 500 charging cycles. You can buy it here. The 10000 mAh Ambrane P-1122 powerbank is said to come with safer chipsets which also improve the charging conversion rate for devices. There is a Reset Mechanism as well and the company says that it features a Short Circuit and Over Voltage protection. It has three USB out ports and you can check it out here. The 10400 mah Micromax power bank features two USB out ports for charging and is rated 5V/2.1A and 5V/1A for the two ports. You can buy it here. The Apple flagship smartphone is powered by the company’s latest A11 Bionic chip coupled with 3GB RAM and 64GB internal storage. It features a 5.8-inch edge-to-edge display and comes with a 12MP rear and a 7MP front-facing camera. You can buy the smartphone here. The Galaxy S8 features a 5.8-inch Super AMOLED Quad HD+ display and is powered by the Exynos 8895 Octa-Core processor. You can buy it here. The Samsung Galaxy S7 Edge is powered by the Exynos 8890 octa-core SoC with 4GB RAM and 32GB internal storage. It features a 5.5-inch display and features a 12MP rear camera and a 5MP front-facing camera. You can buy it here. The Galaxy J2 Pro is powered by a Spreadtrum processor and comes with a 5-inch sAMOLED display. It sports an 8MP rear camera and a 5MP front-facing sensor. You can buy it here. The Panasonic SC-UA7 speaker is a 1700W Bluetooth enabled speaker which also features a USB port and a 3.5mm audio jack. You can check it out here. The Amazon Echo smart speaker comes with the company’s intelligent assistant Alexa and it can do tasks based on voice commands. One can use voice commands and it will play songs, read news, control lights, request a ride via Ola or Uber and more. You can buy it here. The Sony SRS-XB10 is a 5V Bluetooth speaker, which can maintain connection till 10mts. It boasts of 16 hours of audio playback on the 1400mAh battery and can also be connected via NFC. You can buy it here. The UE Wonderboom Bluetooth speaker is IPX7 waterproof and claims of delivering 10 hours of audio playback on a single charge. You can buy the device here. The UE Roll 2 is a 9W portable Bluetooth speaker which is also waterproof and sports a frequency response of 108 - 20000 Hz. You can buy it here.